I don’t know how you guys celebrate christmas, but for me it is every year a big family event. The only one I don’t feel like missing ever. We all get dressed up nicely and meet up at one couple’s place for the celebrations. We have dinner there and exchange our presents after dessert. Then we celebrate until early morning. Before meeting all our family members we all take some time to get pretty and put on some sparkling make-up. 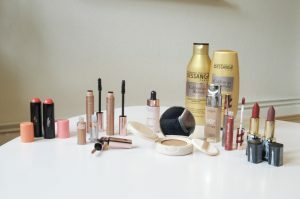 This year I am going to use the L’Oréal products to make a sparkling-christmas make-up and you can win exactly these products and many more for your use at home! First of all I am cleaning my face kindly. Often I am even using a face scrub before applying a more detailed make-up. Once everything is clean I am applying a moisturising creme in my face and neckline. It is important to apply enough moisture especially as you’re not able to apply any after adding your make-up. Then I am applying the Perfect Match Foundation from L’Oréal. It is quite thin and easily to apply evenly everywhere. Don’t forget to go a little further than your face’s surroundings as we don’t want to have any hard lines. 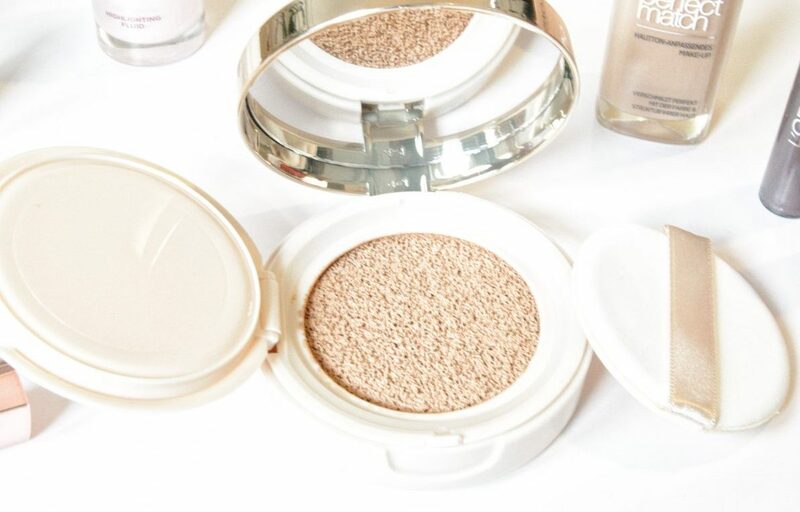 Most of you guys will be used to apply powder afterwards, but I usually prefer to not add any. 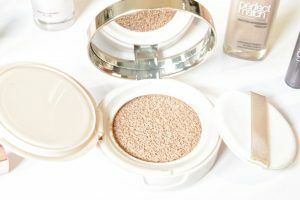 This comes mainly from my experience, that you can see it easily if someone as applied powder, not so much if someone only applies a good foundation. I am all about the fact, that make-up needs to make you look prettier, but natural. Once you’re happy with your foundation you can apply a concealer if you feel like you need some more coverage in some places. Under the eyes or over impurities is usually where I am applying it. Then especially in winter I am adding a little blush. In this make-up set from L’Oréal you will find two different colours of the Infallible Blush Paint I prefer the more orange one, for the same reason than above, it looks a little more natural. I am applying just a little on the length of both my cheeks and then swipe it into my skin gently. It should only be a touch of colour which makes you look healthier, fitter and less ghosty in winter times. Then let’s have a look at your eyes. Depending on your eye colour it is better for you to use either gold or silver applications of the L’Oréal Eye Paint. I usually start with a skin colour eye-shadow, just as a sort of foundation. Then I am applying the details. In this case, as I have blue-greyish eyes silver is what fits me best. If you have warmer colours such as brown I’d suggest you to go with the golden eye-shadow. Apply it over your eye lead, as much as you wish. As for my suggestion? Less is more! I am just applying a little stripe right over my lashes. Then I am applying the Paradise Extatic Mascara. I usually start on the lower part and then apply the upper part, but also here, just do as you prefer. You’re eyes are ready: sparkly but simple and natural. Then we can head down to your lips. I always prefer to surround my lips prior to applying lipstick with a lip-liner because it makes the lines clearer. 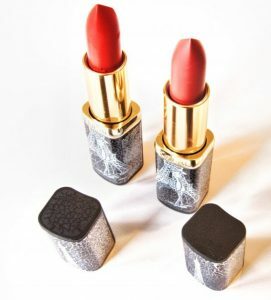 After applying a lip liner I am using the lip stick Lip Paint Metallic in red. I am really loving this colour as it is super perfect for christmas. 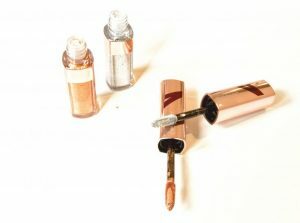 It is important that your lip-liner is a little bit lighter than the colour you are applying afterwards. There you go, you just created your christmas make-up in less than 10 minutes and I hope you like it! Today is the time come for my third give-away of this month. This one is part of the 24 days of christmas blogging ( all give-aways at the end of the page!) The first two weeks I was offering Beauty Products, this week I have the a super large Make-Up Package from L’Oréal with all the products, and many more for the perfect christmas make-up. Next week on the 24th of december I am having my last-give-away of this week: A Bag of Picard, the one I made for myself some weeks ago. Can’t wait to show it to you! The winner will be communicated on the 31st of December. Ich feiere mit meinen Eltern auf dem Dorf, ganz in Ruhe und gemütlich. Die Omi ist auch noch da, wir werden lecker essen, spazieren gehen und einfach die Zeit zusammen genießen. I will celebrate with my Family and my husband. Have a great week! Ich verbringe Weihnachten zu Hause mit meiner Familie. Our celebrations start on christmas eve with decorating the tree. Then me,m family and boyfriend have dinner and go the church afterwards. ich verbringe Weihnachten mit meiner Verlobte und ihren Eltern und dann essen wir gemeinsam. I will be celebraing Christmas with my boyfriend, my cat and lots of food and booze. I’ll be going to my sister and brother in laws this year to meet up with the rest of the family. I’m at home with my lovely family! Lots of music, food and presents and plenty of dog walks! I will celebrate Christmas together with my husband and my two cats this year. We will probably visit his parents for Christmas too. I will celebrate together with my husband and my two cats. We will probably also visit his parents. It will be quiete Xmas with my daughter, my mother and my husband. We had a big loss in 2017 and we all would like to skip Xmas, we only celebrate it because of my daughter. I’ll be spending time with the family! I shall be on my own this year but hoping to hear from a long lost friend around Christmas Eve. Ich werde dieses Jahr mit der ganzen Familie bei uns zuhause Weihnachten feiern und freue mich schon sehr ! Going to my sister’s on Christmas day for dinner with extended family and a nice walk. I’m going to be spending it with my family… it’s my First Christmas as a wife and I have my parents, my grandfather and the in laws over!! Pressure!! Hi! I’m going to spend Christmas at my parent’s place 🙂 on Christmas eve, we are going to visit my grandparents, where we’ll have our traditional Christmas dinner. Heute Abend gibt es Fondue, morgen kommt die Family und übermorgen besuchen wir meinen Onkel! I will be celebrating with my parents & my younger siblings. It’ll be our last Christmas together in the same house as we’re all going our separate ways next year so it’s a big one!